It provides a powerful context for discussions with founders and owners of small and medium B2B manufacturing companies. So often habit, and even accident, become baked into company culture and procedures - and discussions of "strategy" get lost in the gale force winds of managing daily priorities and fighting fires. 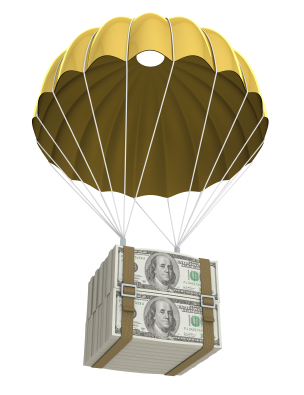 What if an investor parachuted in today and offered you 5X revenue? Likely you'd sell. And then in a year, frustrated and regretful that investor returned asking if you'd consider buying it back for 2X the now diminished revenue? You'd probably do so. And when you stepped back into the business would you run things as though the intervening year of relaxation had never occurred? Of course not. If you can answer that question without hesitation today, then why wouldn't you change those things now which you would do differently in that scenario? If you run a business the answer certainly isn't that you're lazy. Instead you're just like every other business owner...struggling valiantly to keep up with the stream of priorities. It's a valid reason...but we both know it's an excuse. But if you were to put aside the excuse and pick an area upon which to focus would you, could you, should you head for the top line or the bottom? Surely there may be some low hanging fruit you can capture to enhance the bottom line, but realistically your controller, bookkeeper and accountant have already found most of that. That leaves the top - and a bigger, bolder challenge. What kinds of questions would you ask yourself then? Finished with that? Then you've got the framework for your new B2B business development strategy. There's one impediment. You're too close to what you're doing now. You need to "rent" some perspective from an experienced, independent advisor - and that's where a business development consultant can help you quickly expose inappropriate assumptions and identify unrecognized opportunities. Maybe in the SaaS software space a bright and recently minted MBA will fit the bill. But in the B2B manufacturing space and industrial world it's critical to engage an experienced former business owner with relevant domain expertise. Why is former business ownership/general management important? Because opining on strategy from a silo perspective (only sales and/or marketing, or only finance for instance) will yield an unbalanced result which you will instinctively recognize lacks adequate depth. You worry about the entire range of business issues intuitively. So while you need someone with particularly extensive and deep business development experience (which should exceed yours it it's to deliver value) you simultaneously need someone whose understanding of your business wide challenges infuses their insight with actionable value vs. theoretical elegance. While selling your business may seem far fetched today, at some point you'll need to monetize the asset that you've created - your business. And likely many others will have the same goal at the same time. So asking the bold and important "strategy" questions today will give you a head start on others who will market less vibrant businesses. In other words it's not just business development, it's asset appreciation too. Want some quick insight into our business development approach? Check it out here.